MESA now has a section dedicated to its premier statewide events. 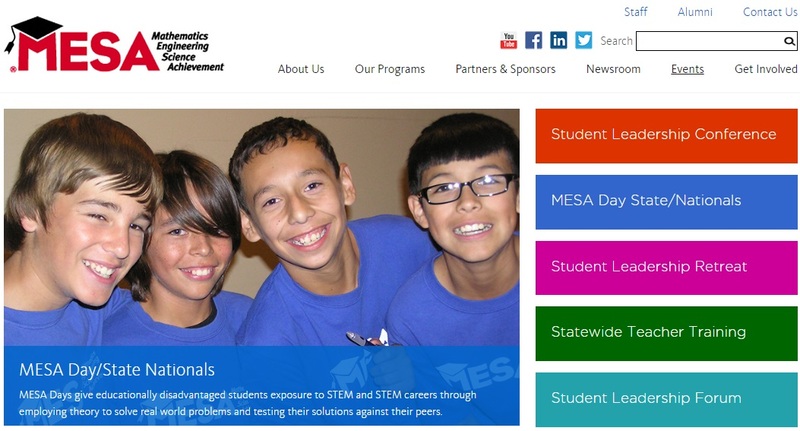 You can find details about MESA’s marquis events including the Student Leadership Conference, a virtual statewide teacher training conference and the hands-on engineering competitions known as MESA Days. It is now also easier to find a MESA center or school near you. We’ve improved our map section, which now let’s you search by segment (K12, community college or university level) and zip code or city. Selecting a location on the map shows basic center information and a link to the center’s website. You can also see a full list of all our centers. So take a minute to see what’s up with MESA!